The Precor EFX 556HRC incorporates upper body arms, forward or reverse motion, and precise heart rate monitoring through touch-sensitive grips on the stationary handles, or Polar® telemetry, so you are sure to experience a superior, total body Cardiovascular workout that will keep you challenged. Like all ellipticals, the 556HRC delivers a biomechanically correct, low impact exercise that reduces the stress to your joints and lower back. The ramp on the EFX556HRC is fixed at an optimal 25 degrees for lower body muscle involvement and you are presented with 20 different resistance levels for workout intensity variation. The Precor 556HRC works with Soft Touch Display, so rather than pushing buttons you merely need to graze the monitor with your fingertips. You will always be aware of which muscle groups are being worked out, the number of strides you're generating per minute, your calories burned, and more, thanks to the easy-to-use electronic display. The cordless, self-powered EFX 556HRC uses a 12V battery that is charged each time the user moves the foot pedals at a stride rate above 40 strides per minute. 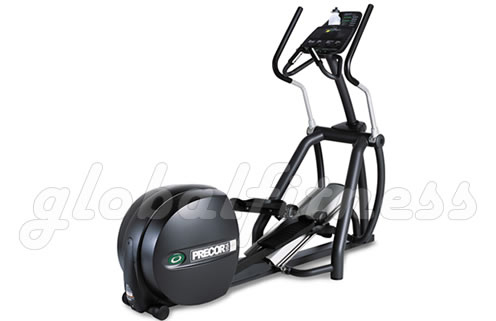 The Precor EFX556HRC is considered to be one of the best ellipticals on the market, and even supersedes in ability Precor's own 5.33 home grade elliptical. Dimensions: 80" X 30" X 64"